This week's focus is something that I love more than anything - Twitter. I would like to start off by saying, or maybe admitting, that I currently have 3 Twitter accounts. Yes, I have 3 separate accounts and there is a very good reason why. Each account serves a VERY different purpose. My first account, @Melanie_Strunk, was the account I started in high school. This account is locked down with privacy settings and I mainly use this account for staying in touch with friends, gossip magazines, celebrities, and other silly nonsense. My next account, @ATrendyTeacher, is where I connect with teachers from all over the world. You may have noticed that this account is the one that I have linked up with my blog, my Facebook page, and my Teachers Pay Teachers store. I would consider this account most closely related to my PLN (personal learning network). Here's a video on Tweet Chats presented by a marketing company. If you want to skip right to the nitty gritty on Tweet Chats jump to 3:21 and you can miss all the introductions. If you'd like to experience your first Tweet Chat or "lurk" as we call it when you don't participate but just watch the conversation as it unfolds, be sure to check out some of these great hashtags that will bring you to fantastic Tweet Chats. -Tweet reminders for parents and families. -Connect with authors and other educational figures that the students know. -Tweeter of the Day (we are starting next week, check back for updates). -Post pictures from projects, experiments, field trips, etc. -Participate in book studies with my staff using a common hashtag. 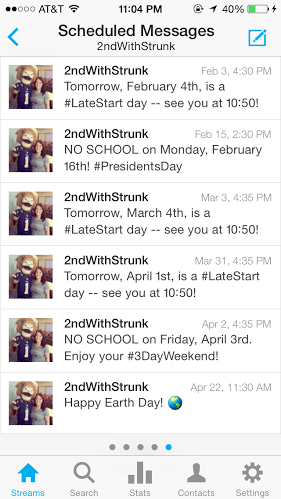 If you plan on associating a Twitter account with your class the one thing I suggest is that you update it frequently! My biggest pet peeve is when teachers set up things online and leave them empty all year. If you need help getting started check out the HootSuite app. This is a great way to make sure your followers will always be able to connect with your content. I hope after reading this you'll have some ideas on how to use Twitter with your kiddos or for yourself. Twitter can seem so foreign when you first start using it, but soon enough it will become second nature. Thank you for sharing all the information for Twitter. This is all still very new to me. One thing that is bothering me is I don’t know how I am going to stay organized with all this. I just added Hootsuite to my phone. Hopefully, that helps! Twitter can seem very overwhelming because it moves so fast. I have learned to just realize that sometimes I'll be able to read a post and other times I'll miss something and it's okay.